Freedom from hunger and thirst - by providing fresh water and a diet to maintain full health. Freedom from pain, injury and disease - by prevention of rapid diagnosis and treatment. Freedom to express normal behaviour - by providing sufficient space, proper facilities and company of their own kind. Freedom from fear and distress - by ensuring conditions and treatment are a high standard to avoid mental suffering. Adopting a guinea pig from EPGPR is a friendly process. EPGPR will help potential adopters meet the requirements. It would be irresponsible for EPGPR to rehome guinea pigs to a home that does not meet the requirements. A home visit will take place prior to adoption to ensure that the guinea pigs being adopted will be happy in their new homes. 120cm x 60cm x 60cm (4ft x 2ft x 2ft). In the interest of the guinea pigs the larger the accommodation the happier they will be. Accommodation should be well ventilated, dry and draught-free. Adopters must be able to provide indoor accommodation during winter months. This could be in a home, heated shed of conservatory. Ideal temperature for guinea pigs should be between 17-20C. Temperatures above this can be dangerous for guinea pigs and provisions should be made to ensure guinea pigs are kept safe. Piggies must be kept safe from predators. They should have access to safe hiding places to help them feel safe and secure. Hay should be provided to allow guinea pigs to burrow into, and keep warm. Accommodation should be cleaned out regularly to ensure they live in clean, dry conditions. Guinea pigs benefit from the additional change in environment. It gives them stimulation and exercise. Hay is an essential part of a guinea pigs diet (80% of a piggies diet). In addition to hay they should be given a selection of fresh fruit and vegetables, and a quality guinea pig nugget food. Fresh water should also be available at all times. Guinea pigs are very sociable and enjoy company of their own kind. They should not be housed with rabbits or other animals. Finding a friend for your existing piggy is not always straight forward. EPGPR are experienced in 'bonding' guinea pigs and may have a new friend for your guinea pig waiting at the rescue. Please Contact EPGPR to discuss and arrange a time for piggy bonding..
Adopters must seek medical treatment immediately if the guinea pigs show signs of injury or ill health. It is important that the adopter finds an experienced guinea pig vet before adopting. EPGPR may also have other guinea pigs in the rescue that have not been added to the website yet. For further details on the guinea pigs that will soon be available please Contact EPGPR. Bonded pair of guinea pigs - minimum amount of £30. A neutered boy - minimum of £40. Any donation made goes directly towards the care of the guinea pigs at EPGPR. Most spend some considerable time at the rescue, they are sexed, health checked (treated as necessary – which sometimes can take some considerable time and expense), loved and cared for until they move on to their new home. 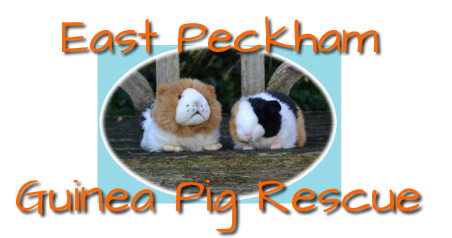 EPGPR bond all guinea pigs that come in to find a new friend and full rescue back up is provided should dvice ever be needed or require the guinea pigs to come back into rescue at any time. The donation fees are a guide line, and the most important thing is that the piggies go to a 5* home. Without the generous donations EPGPR receive from supporters, the rescue would not be able to help as many guinea pigs. EPGPR do NOT breed any guinea pigs. However, we do sometimes have babies born to guinea pigs that are brought to the rescue. All the guinea pigs rehomed by EPGPR will be rehomed in pairs, trios, groups or as a companion for another suitable lone guinea pig. NO guinea pigs will be rehomed as a companion for a rabbit. NO guinea pigs will be rehomed for breeding purposes. EPGPR provide after care support for any guinea pigs rehomed from the rescue. If for any reason you can not keep your guinea pigs rehomed through the rescue. EPGPR will welcome them back.